FJ: Can we have a short chat? Edward: Yes sure. Let's talk slowly on my recommended terrace. You can view the Tokyo Tower from here. FJ: What is the reason you came to Japan? Barbara: I came from Italy. My name is Barbara. Since I am taking a Japanese language course, I came to Japan as an exchange student. I always wanted to come to Japan and I wish to study the Japanese language in Japan. 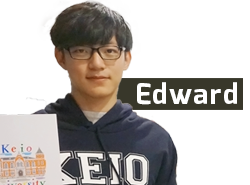 Edward: I’m Edward, and I’m Chinese from Canada. I’m currently taking the economic course and I came here also as an exchange student. I was in Vancouver, Canada. I came to Japan to experience urban life in Tokyo. 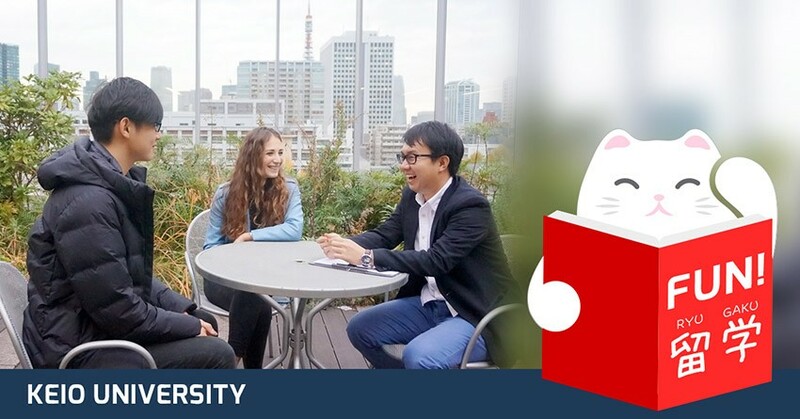 FJ: Why did you choose Keio University? Did you ever consider about other institutes? Barbara: I really like Japanese temples and Japanese gardens, so I’ve actually considered about Kyoto University also. However, Keio University's programs are diversified and we can pick up courses as we wish. I think the system matches my requirements perfectly. Actually, there are many students at my university who wanted to go to Keio and it was highly competitive to be chosen as an exchange student. Edward: Of course one of the reason is that the college is at the TOP level. I was considering about Waseda University, Tokyo University, etc. at the stage of institute selection. Among them, the location of Keio University is the most convenient for me. There are three main stations which are only within 10 minutes on foot. Moreover, I can access to Tokyo station, Tokyo Tower, Shinagawa station within 20 minutes. Isn’t that amazing? FJ: What is your opinion after you came to Keio University? Do you think is good? Barbara: All of the lecture I taking in Keio University currently are all available in English, and I have many opportunities to communicate with Japanese people. Edward: The Mita Festival is awesome. It is held for four days every November. It seems like it is the school festival with the most visitors in Japan. I am proud to be studying at this university with this Mita festival which has more than 200,000 visitors. What does Mita Festival like? Please come during next year Mita festival and check it out with your own eyes. FJ: What your level of the Japanese language? Did you ever have any difficulties when it comes to learning Japanese? Any issues you face in Japan? Barbara: I think my level is about N2. However, I cannot memorize the onomatopoeia word such as Pekopeko, tsurutsuru, and pokapoka. Edward: I think my level is about N3 ~ N2. When I just came to Japan, I did not really understand expressions such as "sa”, “no”, “na” that come out in my daily conversation. Barbara: ：When the semester starts, there was a Buddy Program which called as “Keio Tomodachi Program” where we gathered and communicate with other members. I keep in touch with those friends I met during that event and help out each other. Edward: There is an “International Center” at the university which supports international students. When you encounter any issue, they will help out. FJ: Is there any Japanese culture or custom that you are not used to? Barbara: The habit of taking off shoes. I always forget to take off my shoes when I enter the fitting room. Edward: Me too. When I went to the public bath for the first time, I was scolded when I entered without taking off my shoes. 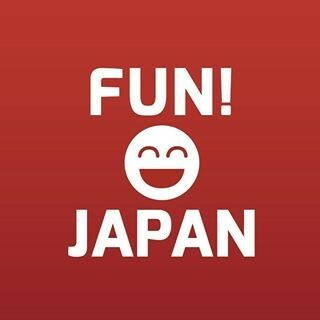 FJ: When it comes to learning Japanese practically back in your home country, what kind of lessons would be helpful? 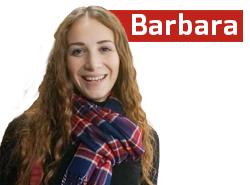 Barbara: ：Role Play. We set a scenario, think and talk in Japanese accordingly to the situation is useful. Besides, it was important to make an opportunity to talk with Japanese people. By sharing and teaching my own language with them, the Japanese taught me the Japanese language. Edward: That's right. With Role Play, we managed to set up the scenario such as hospitals, part-time job, and so on, and practice the conversation during the situation. FJ: What do you like to do except for school life? Barbara: Travel. I went to Beppu last week. I like to go around hot springs in Japan and those places with great history. Edward: I will explore the area around the station that I have never been to. I like to discover the shopping street and enjoy the gourmet there as well. Even though the neighboring Keio Nakadori shopping street is amazing, but I was glad and happy to find a delicious shop by walking around at Sugamo Jizo Dori shopping street in Tokyo and Nakano Sun Mall shopping street!